Powers/Abilities: Circuit Breaker's cyborg parts enable her to store and direct large amounts of electricity. She also has magnetic powers of attraction and repulsion that allow her to fly. She has at least some degree of control of electric power in nearby machinery, which at least once allowed her to swiftly reprogram computers. Her suit also served as a surrogate nervous system, allowing her complete motion despite her damaged natural nervous system. Even without her bodysuit, Josie Beller is a very skilled technician. History: Josie Beller was a brilliant computer expert who lived on Earth-120185, a world whose Earth differed from Earth-616 mainly in that it became a theater for the conflict between the alien mechanoid lifeforms called the Autobots and the Decepticons. She worked for the industrialist G.B. Blackrock. (Transformers I#6)- The Decepticon Shockwave attacked Blackrock's state-of-the art oil-drilling platform, plowing through the Terrans' defenses. Beller personally led the attempt to rout Shockwave. During the conflict, Beller fired a harpoon at Shockwave, which became lodged in his armor. Shockwave, in gun mode, pulled himself away, tearing off a big part of the rig connected to the harpoon cable. The Decepticon then threw it back at the rig, and the resulting electrical shock severely injured Beller, paralyzing most of her body. (She can only do some motion with her right hand.) Shockwave usurped the platform, banishing the defeated humans, and then directed his fellow Decepticons to join him on the rig. (Transformers I#7)- Beller's employer paid her a visit in the hospital; the determined Beller, despite her ruined body, continued to work, creating devices to aid her in vengeance against all robots. (Transformers I#8)- The Decepticons managed to usurp one of Blackrock's aerospace plants. Shockwave, coming to join his compatriots, shrugged off the efforts of the American soldiers who had surrounded the Blackrock plant when they tried to stop him. A furious Beller watched him enter the complex from her hospital window. Later on, Beller manifested the power to destroy a computer with a flip of her hand. (Transformers I#9)- Blackrock again paid a visit to Josie Beller, who showed him some inventions she had made while recuperating. When she stated to him that she had resolved to exterminate all robots, he told her she should rest instead. However, hours later, in Blackrock's office, the industrialist was confronted by her. Now clad in a metal exoskeleton, she had taken the nom de guerre "Circuit Breaker", and demonstrated her abilities. Beller again offered her assistance in destroying the robots, but Blackrock again brushed aside her suggestion. The single-minded, incensed Circuit Breaker left, paying no heed to what Blackrock said. Later, Blackrock oversaw the presentation to a mass of people in a stadium of an anti-robot cannon, but the cannon did not function. Circuit Breaker emerged, taking credit for neutralizing the cannon, and demanded that Blackrock acknowledge her as his champion against the robots. Before Blackrock could respond, the Decepticons Starscream and Frenzy blitzed the onlooking crowd. Autobots Jazz and Wheeljack confronted them, resulting in a pitched battle. When Circuit Breaker ruthlessly started attacking both Autobot and Decepticon, Starscream and Frenzy flew away to safety. 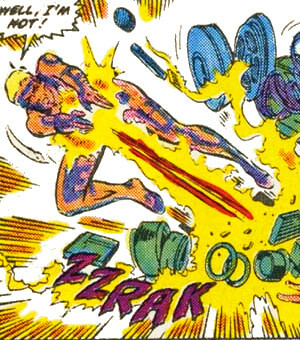 Circuit Breaker had an opportunity to attack Jazz, but Blackrock persuaded her to spare him. 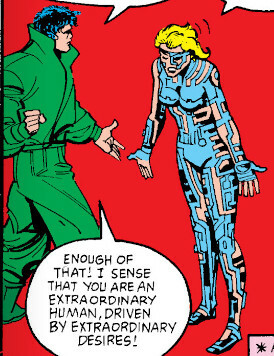 Hesitantly, Circuit Breaker decided that she owed her employer a boon for his aid to her, and decided to give him Jazz's life as that gift, but declared that she would continue her anti-robot mission, leaving. (Secret Wars II#3)- Circuit Breaker encountered the Beyonder (see comments) after he had started a multiversal attempt to fulfill his desires by taking over Earths down to the molecular level. When Circuit Breaker, after thanking the Beyonder for his wise rule, commented that she hated robots because they had no free will, the Beyonder began to doubt the wisdom of his actions, and eventually relinquished his control over the Earths. (Transformers (UK)#41/1)- Wandering around in late December, Circuit Breaker saved a little girl from drowning in icy waters, but was rejected by a crowd of people as a freak. Later, Circuit Breaker ran across the Autobot Jazz with his human associate Buster Witwicky. Seeing Buster injured, she jumped to the conclusion that Jazz hurt him. However, Buster persuaded her that Jazz did not. As it was Christmas, Circuit Breaker acted in a magnanimous fashion and left without harming Jazz. (Transformers I#18 (BTS))- At the Columbia River Gorge, human soldiers confronted a group of Autobots who had recently returned to Earth from a battle with Lord Straxus on Cybertron. Unknown to the Autobots, Circuit Breaker led these soldiers. (Transformers I#22 (fb))- Circuit Breaker, now a leader of the government strike force RAAT (Rapid Anti-Robot Assault Team), successfully ambushed the Autobots at the gorge. (Transformers I#21-23)- Circuit Breaker had the robots taken apart for study, and had their faces mounted on walls as prizes. At RAAT headquarters, Circuit Breaker and her associate government agent Walter Barnett went over what occurred during the ambush at the Columbia River Gorge, watching a videotape of the incident. Barnett pondered the possibility that they could have tried talking and reasoning with the robots, which Circuit Breaker summarily rejected. Later, RAAT received intelligence about an Autobot named Skids saving the life of a motorcycle rider. However, the Decepticons also received the intelligence, and their leader Megatron sent his subordinates the Stunticons to act on it. A day later, the Stunticons found Skids, with RAAT also arriving to engage them in battle. Soon, more Autobots arrived to give Skids (who had contacted them for help) air support. The Autobots' human associate Donny Finkleberg (who had been traveling with Skids) went to Barnett and Circuit Breaker. Finkleberg tried to persuade them that the Autobots were benevolent, but the crafty Stunticons pretended to be allies of Skids who had come to protect him. Circuit Breaker managed to take out the Autobots, except for Skids, who escaped with Donny. However, later, when Skids entered into a state of rest resembling sleep, Donny contacted Barnett and informed him as to the whereabouts of the dormant Skids in return for fifty thousand dollars. At her headquarters, Circuit Breaker tinkered with the dissected Skids as Donny Finkleberg warily observed her. While she interrogated Donny for further information on the Autobots and gave an anti-robot tirade, Donny realized the mistake he made in betraying Skids. Within a week, RAAT acquired an odd report of U.S. monuments being discovered with strange symbols etched on them. Circuit Breaker recognized the markings as having been done in the Cybertronian alphabet, though she couldn't translate their meaning. Circuit Breaker and her organization tried to predict the next such incident, in order to bag the robots responsible. After one such event, members of RAAT meet a traveling family called the Actons, whose trip across America coincided with many of the places where the Cybertronian markings appeared. When the Actons went to the next spot on their itinerary, Independence Hall, the Decepticon Battlechargers, who had been following the Actons and made the strange markings, appeared. RAAT attacked the Battlechargers, but relented when bystanders were endangered. When Circuit Breaker realized that she could not stop the more powerful Battlechargers, Donny Finkleberg recommended reactivating the Autobots that RAAT imprisoned. Thus, a day later, RAAT performed a stakeout at the Statue of Liberty in anticipation of the Battlechargers attacking it. The RAAT members could not stop the Battlechargers until Circuit Breaker arrived with a slave robot composed of parts of the disassembled Autobots. Circuit Breaker swiftly annihilated the Battlechargers. A stern Walter Barnett confronted Circuit Breaker and Donny, upon their returning to headquarters. Circuit Breaker did not return with the captured Autobots; instead she set them free, as part of a bargain to get them to agree to her plan to destroy the Battlechargers. Barnett expelled Circuit Breaker from RAAT, and she left its headquarters. (Transformers I#45)- Circuit Breaker reemerged when news reports came out about a creature called Skullgrin, an entity believed to be a Yeti-Sasquatch-like being who was in fact a Pretender Decepticon (a Decepticon who wears an outer shell making him appear to be a member of another species). Skullgrin, in order to gain oil for the Decepticons, agreed to allow a film producer to use him in a production, in return for oil as payment. Circuit Breaker suspected Skullgrin to be a Cybertronian, going to California to investigate him. She had a glimpse of Skullgrin at a press conference held by the producer, but could not be certain if Skullgrin was a Transformer or not. However, she did run into Carissa Carr, who was to appear in the film with Skullgrin. Circuit Breaker, whom Carr believed to be a harmless physically challenged person, discovered that the filming with Skullgrin would commence in a couple of days at the Grand Canyon. During the making of the film at the Grand Canyon, Skullgrin took off his Pretender shell. Seeing this from nearby, Circuit Breaker finally had irrefutable proof that Skullgrin was a Transformer, and jumped into combat. She took control of Skullgrin's Pretender shell and attacked him with it. During the skirmish between Circuit Breaker and Skullgrin, Carissa Carr was caught on a crumbling cliff, but Skullgrin selflessly rescued her, though it gave Circuit Breaker the chance to press her attack. Before she could totally destroy Skullgrin, the Hollywood producer who had been dealing with Skullgrin called out to Circuit Breaker. He informed her that his workers taped her battle with Skullgrin, and that he would pay her a fortune to slay Skullgrin in front of the camera. Circuit Breaker, disgusted at the producer's greed and not wanting to perform in a Transformers version of Faces of Death, destroyed the camera and left. (Transformers I#68)- At night, at the island the Matacumbe Key, Circuit Breaker entered a bar on the docks to meet with Hector Dialonzo, a metahuman who had used his powers in a counterattack against the Decepticons. As they started to discuss his plans, the Decepticon Starscream ripped the roof off of the bar and grabbed Hector. Circuit Breaker attacked Starscream, but an unseen assailant knocked her down. However, before Starscream could make good his kidnapping of Hector, Circuit Breaker's ex-employer Blackrock's helicopter arrives. It released two metahuman agents of Blackrock's code-named Rapture and Thunderpunch. They swiftly defeated Starscream. Though Circuit Breaker desired to continue the attack on Starscream, Hector demanded that everyone present tell him why they came searching for him. Starscream stated that he offered Hector a partnership in a plot for world hegemony, while Circuit Breaker stated that she wanted to recruit Hector in a campaign against the Cybertronians. Blackrock offered Hector membership in a team of metahumans he had begun to assemble. Hector agreed to join Blackrock's team, as did Circuit Breaker. (Transformers I#72)- Circuit Breaker, along with the other members of Blackrock's team (called the Neo-Knights) confronted the Decepticon leader Scorponok in New York City when he began a battle with his rival for Decepticon leadership Shockwave. (Transformers I#73-74)- Though Scorponok mocked the idea of metahumans, the Neo-Knights vigorously attacked him. When Autobots Optimus Prime and Nightbeat attempted to restrain the Neo-Knights, Shockwave blasted Circuit Breaker from the rear. Circuit Breaker mistakenly believed Nightbeat attacked her. She attacked the Autobots. Taking advantage of the diversion, Shockwave started to fly away, and then went into gun mode to destroy Scorponok. When Circuit Breaker observed what Shockwave was doing, she remembered how he crippled her on the oilrig, and blasted him with all of her power. Shockwave fell into the Atlantic Ocean, and Circuit Breaker fainted. Meanwhile, the demonic enemy of the Transformers, Unicron, has begun to reach Cybertron. The god who created the Transformers to defeat Unicron, Primus transported all of the Transformers on Earth, along with a chopper carrying the Neo-Knights to Cybertron in anticipation of a great battle with Unicron. (Transformers I#75)- Primus' servant Emirate Xaaron informed the Neo-Knights, Autobots, and Decepticons of the truth about the origin of Unicron, Primus, and Cybertron. Later, Optimus Prime, conferring with the Neo-Knights, found out that Circuit Breaker's mind, due to the shock of being on a world populated with robots, had retreated into an autistic state. Prime thought of transporting the Neo-Knights to Earth to spare them the battle with Unicron, but he could not reach Xaaron and Primus to ask them to do so. Unicron did arrive. Blackrock attempted to dissuade the Neo-Knights from trying to oppose him, but they persuaded him that they should fight to the finish. Though they did join the battle against the powerful demon of chaos, the Neo-Knights proved unable to make a serious dent against him. Desperate, Blackrock started hitting and shouting at the withdrawn Circuit Breaker, but he could not snap her out of her funk until after Unicron had slain hundreds of Transformers, Primus, and Xaaron. Pushed to her psychological limits by anger, Circuit Breaker managed to mindblast Unicron. This gave Optimus Prime the chance to defeat Unicron. (Transformers I#77-78)- Due to stresses resulting from Unicron's attack, Cybertron began to break up. The Autobots prepared to leave the planet on a spaceship, placing the Neo-Knights in a storage chamber on a ship. Circuit Breaker withdrew further into herself. Optimus Prime had died, but his humanoid confidant, HiQ (whose mind had merged with that of Optimus Prime due to a psychic link), placed in the chamber with the Neo-Knights, asked them to help him find the "Last Autobot"; they agreed. Circuit Breaker remained in a comatose state. (Transformers I#79 (fb, BTS))- Hi-Q explained to the Neo-Knights the importance of the "Last Autobot". (Transformers I#79)- The Neo-Knights and HiQ, having left their storage chamber before the Autobots left Cybertron (they carried the unconscious Circuit Breaker with them), continued to search for the "Last Autobot", though Cybertron continued to break up. They finally succeeded in finding him. (Transformers I#80 (fb))- The Last Autobot transfigured Hi-Q into a duplicate of Optimus Prime. (Transformers I#80)- Since the defeat of Unicron, the Decepticons renewed their war with the Autobots. However, the Neo-Knights caught a group of Decepticons waiting to ambush Autobots. The resurrected Optimus Prime, jumping from a nearby spaceship, arrived. The vehicle touched ground and turned into the Last Autobot. The Last Autobot revealed that Primus created him to provide guidance to the Autobots after he was gone. He revealed that he restored Optimus Prime to life, and that he had declared that the Autobot-Decepticon war must end. The Decepticons resisted his ruling, and fled. Optimus Prime declared that the Autobots would return the Neo-Knights-- including the blanked out Circuit Breaker-- to Earth. Comments: Josie Beller created by Bob Budiansky and Alan Kupperberg; Circuit Breaker created by Bob Budiansky and Mike Manley, first depicted in a story by Jim Shooter and Al Milgrom. An entry that shouts out for comments! This entry serves as a place to address the complicated issue of the relationship between the Transformers and the Marvel Universe-- and for that matter G.I. Joe and the Marvel Universe- specifically Earth-616. The first indication that the Transformers stories took place anywhere remotely within the rubric of the Marvel multiverse first happened with the appearance of Spider-Man in Transformers#3. (A footnote in that story even noted that Spider-Man wore his black symbiote costume because this story took place before Amazing Spider-Man#258!). Brief appearances or mention of Nick Fury with Dum-Dum Dugan (of S.H.I.E.L.D. ), Dazzler, and Reed Richards occurred in this issue. The Savage Land appeared in Transformers#4 and#8. Circuit Breaker's aforementioned appearance in Secret Wars II#3 came out around the same time as#8, and actually predated her first appearance as Circuit Breaker in the Transformers regular series. However, later on, the letters page of Transformers declared that the Transformers stories did not take place on Earth-616, the mainstream universe, and so such references to Marvel-owned properties declined and faded away. The continuing Decepticon/Autobot war was felt to be too disruptive to Earth-616 continuity. However, through a back door, readers eventually discovered that, while not on Earth-616, the Transformers still existed somewhere that could be reached from there. However, I should note that the Transformers Universe Death's Head traveled from, the one seen in the British comics, was not exactly the same as the one in the American Transformers comics. Although large contradictions were avoided, and almost all American Transformers stories were also part of the British continuity (by way of getting reprinted in the British Transformers comics) the British and American Transformers comics did have a slightly different continuity. Many of the differences had to do with the fact that Simon Furman made more use of the ideas and characters from Transformers: the Movie and more time-travel/future stories than the American comics did. An especially notable point of divergence occurred around the death of Bumblebee. As mentioned above, in the British comics, Death's Head killed Bumblebee, who was rebuilt as Goldbug. However, in the American comics, Bumblebee became Goldbug after being killed by...G.I. Joe! Yes, in a special crossover mini-series called G.I. Joe and The Transformers, G.I. Joe met the Transformers, and due to Decepticon trickery, killed Bumblebee, although they later helped rebuild him as Goldbug. Thus, it was established that G.I. Joe existed in the same universe as the Transformers for the American continuity. As regards the American comics, G.I. Joe met the Transformers again much later in G.I. Joe#138-142, and Transformers: Generation 2#2. Soon after this, yet another divergence occurred, however; since in Transformers: Generation 2#4, the Decepticon Bludgeon initiated a massive assault on Earth, something that nobody on Earth could have missed...yet we never heard anyone in G.I. Joe make a reference to it in the last year or so of the Marvel run of the title. (G.I. Joe was cancelled at issue#155.) I posit that this last year or so of G.I. Joe occurred in a parallel Earth which diverged at some point after G.I. Joe#142, in that Bludgeon never attacked Earth. Since the recent Image G.I. Joe comics draw heavily on the Marvel G.I. Joe series, with Larry Hama having even recently returned to writing G.I. Joe for a series of stories to explain what happened in-between the last issue of the Marvel series and the first issue of the Image series, and since Image does not have the rights to the Transformers (Dreamwave does) and will never mention Bludgeon anyway, one can conclude that the recent Image G.I. Joe series takes place in that universe. Jumping back to Circuit Breaker, however, the best explanations for her appearance in Secret Wars II#3 entail two possibilities. 1. She had an Earth-616 counterpart whose origin did not connect to the Transformers. Plenty of malfeasant robots exist on Earth-616 (Quasimodo, Ultron, Adam-II, Nimrod, the Super-Adaptoid, the Awesome Android, Tess-One, Kree Sentry#459, the Sentinels, the Prime Mover, etc.) who could serve as substitutes for the Decepticons. Also, since Earth-616 characters such as Spider-Man have been shown to have counterparts in both Transformers continuities, why not vice versa? 2. If you read Secret Wars II#3, it plays out that the Beyonder decides to take over every human being, then every living being, then inanimate objects, and then molecules. The story then shifts to other characters (Molecule Man and Volcana), and we don't pick up with the Beyonder until a few pages later. With such a progression of his thought, the Beyonder could have also said "Hey, why take control of one Earth? Why not go multiversal?" and started hoping around parallel Earths, conquering them. The Beyonder obviously could travel between dimensions (in a story published years later he even visited the world of the Guardians of the Galaxy in#38 of their title), and since Death's Head had proven that you can go from the world of Earth-120185 to Earth-616, and since Earth-120185 has enough elements (the Savage Land, Spider-Man, Mister Fantastic) to possibly qualify it as a world within the Marvel Multiverse, getting there would have been child's play for the Beyonder. I have in any event made the presumption that the Beyonder interacted with the Circuit Breaker of Earth-120185 for this entry. For the reasons that the American Transformers comics are more readily available on-line (see link below) and as noted, with the exception of the G.I. Joe crossover mini-series most American stories also took place in the British continuity, and the fact that Circuit Breaker only appeared in one story unique to the British comics, I have generally listed the American issues to reference her appearances. For the curious, I have provided a link to a conversion chart if you want to see when the American comics were reprinted in the British series. All issues of the American regular series are available for free online. 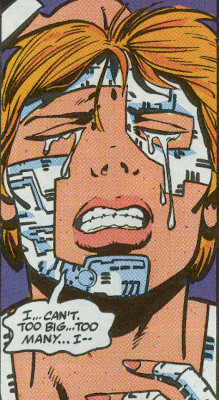 We never saw Circuit Breaker again in the Marvel Transformers comics, as the Generation 2 series made no mention of her. We can presume that the Autobots returned her and the other Neo-Knights to Earth, though. Incidentally, since Simon Furman now writes the Dreamwave Transformers comics, and one of the series at that publisher heavily references the Marvel series, it is possible that it exists in the same timeline as Earth-Transformers US or Earth-Transformers UK. However, as to whether Circuit Breaker will return there may not be possible, for as a Marvel-created character, she may not be accessible. It is not clear how the rules regarding totally original characters created for licensed series work, but I would not assume that Hasbro (makers of the Transformers toys) owns Death's Head just because his introduction took place in a comic based on their property. The Sax Rohmer estate does not own Shang-Chi just because he is Fu Manchu's son, and Conan Properties, Inc. does not own Kulan Gath just because he first appeared in a Conan comic. Circuit Breaker is owned entirely by Marvel. If they wanted to reprint Secret Wars II, her appearance wouldn't stop them. In fact, Simon Furman and Andrew Wildman pitched a "Techno X" series to Marvel after the Transformers ended. Techno X (shown below) would have been a relaunch of sorts for the Neo Knights, a small band of metahumans that were embroiled in the Transformers' war on Earth. And long story short, Marvel Editors have said several times is Lettercols that Transformers never existed in 616. This also includes an image from Techno X. Interesting stuff if accurate, especially the ownership thing for Circuit Breaker. Furman would presumably know. As far as Circuit Breaker appearing in "Secret Wars", one of the indicias of the Transformers book was that everything was copyright of Hasbro. And I felt like Circuit Breaker had enough potential that maybe she could be spun off into something one day and I didn't want Hasbro to own her. She had nothing to do with the toys, she was a human character and so I spoke to Jim Shooter about it and he agreed to feature her briefly in "Secret Wars" before she was printed in Transformers. So that was to keep the copyright under Marvel, not Hasbro. According to the Beyonder's most recent handbook entry, Circuit Breaker does indeed have a 616 counterpart, and the Beyonder did not travel to Earth-120185 in Secret Wars II#3.